Sidi Barrani, Bardia, Sollum, Sidi Rezegh, Mersa Matruh, Bir Hacheim, El Agheila, Beda Fomm, Sidi Omar, Benghazi … The names of many remote North African villages were written into history in 1941-1942 as British and Axis armies battled back and forth across the scrubby desert wastelands of northern Egypt and Libya. Yet another name became legendary in World War II as a symbol of heroic and determined resistance: Tobruk. After routing dispirited Italian forces in Libya during the campaign to protect the vital Suez Canal and other imperial interests, in the spring of 1941 the British Army found itself up against far tougher opposition: Lt. Gen. Erwin Rommel and his newly formed Deutsches Afrika Korps. The aggressive, headstrong Rommel had arrived in Tripoli that February and was eager to get at the British. n His orders were to recapture Cyrenaica, the eastern region of Libya, and its chief town, Benghazi, which had been seized from the Italians by Lt. Gen. Richard O’Connor on January 22, 1941. The bold, resourceful German leader who would come to be known as the “Desert Fox” had been ordered by Berlin not to start an offensive until his forces were up to strength. Nevertheless, he decided to seize the initiative with a surprise attack on the over extended British and Commonwealth forces. Rommel launched his assault on March 24, 1941, sending three mechanized columns rumbling northward and eastward. The fast-moving Germans chased the retreating British along the coast road, rolled into Benghazi, and swept on to Barce and Derna. One panzer column captured inland fuel dumps and burst out onto the coastal plain at Gazala. Another column executed a wide flanking movement to try to capture British units evacuating from Cyrenaica. The Allies were in full retreat, and it seemed as if nothing could halt Rommel’s advance. On April 6, Allied fortunes reached another low point when a German motorcycle patrol captured General O’Connor, one of the most capable British field commanders in the Middle Eastern Theater of Operations, and Lt. Gen. Philip Neame. On April 11, Good Friday, the Germans seized Bardia, and four days later, Sollum. They pushed on relentlessly eastward toward Egypt and the Suez Canal. Rommel, too, was aware of this. As his forces pushed eastward, the British stronghold at Tobruk posed a serious threat to his flank and rear. Its capture was to become a seven-month obsession. The Desert Fox told one of his divisional commanders, “We must attack Tobruk with everything we have—before Tommy has time to dig in.” Tommy, however, had already dug in. The 9th Australian Division, which had withdrawn from Derna to escape Rommel’s net, had moved into Tobruk to reinforce British and Indian Army units already there. 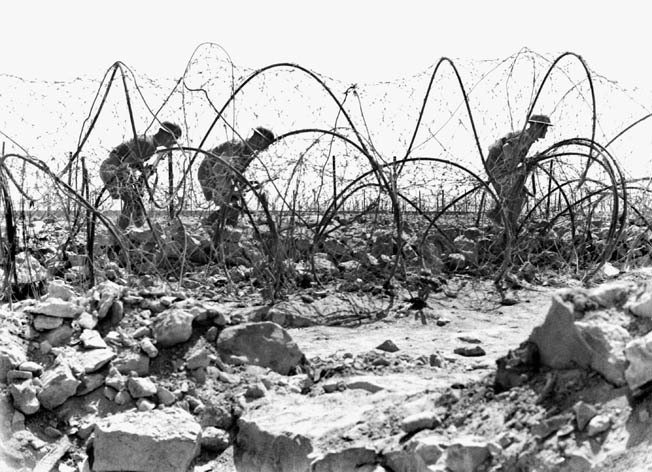 The 23,000-man garrison dug in behind two old Italian defense perimeters that embraced a 30-foot antitank ditch, 70 strongpoints, and a minefield crisscrossed with barbed wire. The 30-mile outer perimeter, called the Red Line, was studded with concrete-shielded dugouts manned by machine-gun and Bren gun crews. Elsewhere in the 220-square-mile Tobruk enclave, the defenders waited with their 26-ton Matilda infantry tanks, 25-pounder field guns, and heavy antiaircraft batteries. At 5:20 am, supported by artillery fire and screaming Junkers Ju-87 Stuka dive bombers, German panzers rumbled unmolested through a gap blasted in the southern perimeter wire. The staunch, light-hearted Australian defenders huddled in the perimeter strongpoints made no attempt to engage the enemy tanks. Then, as the German infantrymen passed the strongpoints, a murderous fire hit them from the rear. The panzers ground on until the leading battalion was two miles inside the Tobruk perimeter. They were moving into an elaborate trap. Suddenly, the German tank crews found themselves caught in a corridor of heavy gunfire. British and Australian field guns blasted them from both flanks at a range of only 600 yards. Clouds of dust and smoke obscured the vision of the German drivers and gunners as the panzers milled about in confusion. Joining in the Allied barrage were 2-pounder antitank guns and captured Italian coastal pieces that the resourceful Aussies had turned around to face inland. One hit sheared the turret of a panzer clean from its mountings, and a staff car was blown to bits. The Allied gunners destroyed 16 out of 38 panzers, forcing the rest to withdraw. The Desert Fox attempted another assault two days later, on April 16. This time, he took personal command and sent the Italian Ariete Armored Division and an Italian infantry division against the western perimeter. The Italian tanks took refuge in a wadi, and Rommel could not induce their commanders to continue the attack. The Italian infantrymen took the brunt of an Australian counterattack and quickly surrendered. One whole company gave up to a British scout car crew. In all, 800 Italians were taken prisoner. The Ariete Division lost at least 90 percent of its tanks to breakdowns. The following day, Rommel called off the attack. He still believed that he could take Tobruk, but he was underestimating the fighting spirit of its defenders. Every night, 20-man Allied patrols sneaked out to harass the Germans. An entire battalion of a crack Italian Bersaglieri rifle regiment was captured one evening, while an Indian Army patrol returned another night with two small sacks containing 32 human ears. For the men guarding the Tobruk perimeter, concealment was vital. They stayed underground during daylight hours to escape the attention of German snipers, and they swept away footprints outside their camouflaged dugouts so that Luftwaffe air crews would not see the tracks. Along with the Germans and Italians, the Allied soldiers battled heat, dust, fleas, lice, flies, dysentery, and boredom. After the defenders of the stronghold were dismissed in Nazi propaganda as “rats in a trap,” they soon started calling themselves the “Rats of Tobruk.” The name resounded in headlines throughout the British Empire. 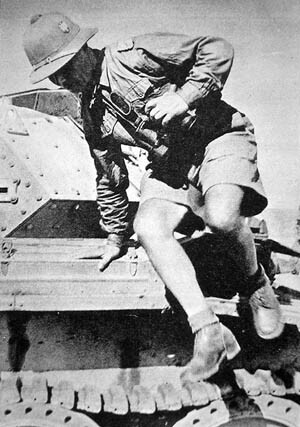 The Tobruk defenders endured regular attacks by enemy bombers and Stukas but tried to make the best of it. There was a shortage of fresh food and drinking water, so the troops took vitamin tablets. Some fresh water was produced in ingenious stills made from old gasoline drums, but the taste was always sulfurous. Water was rationed to six pints a day per man. The Rats of Tobruk subsisted chiefly on the old British Army standby of bully (corned) beef. It was cooked in a variety of ways, from rissoles (hamburgers) to hash, and augmented by canned stew, canned fruit, and rock-hard Army biscuits. Living quarters in the town were mainly stone houses, bombproof tunnels that had been dug by the Italians, and shelters constructed of concrete slabs, assorted bits of wood and tin, and sandbags. The defenders kept up their morale by listening to BBC news broadcasts every night from London which were preceded by the famous chimes of Big Ben. When not manning their guns against enemy raiders, they staged variety shows in an improvised theater, gambled, ironed uniforms, darned socks, and read their own newspaper, Tobruk Truth. Each night, they listened—along with thousands of other Allied and German troops in the Mediterranean Theater of Operations—to broadcasts of Lale Andersen singing “Lili Marlene.” The haunting ballad about a sweetheart waiting “underneath the lamplight by the barrack gate” was the German soldiers’ favorite song, but became the unofficial anthem of all desert soldiers. The battle raged on through the night, and the Allied strongpoints were still active the following morning. They harassed the invaders from behind as other British units retaliated with artillery and tank fire. Dust storms made tactical coordination difficult for both sides. The seesaw struggle continued for three days before Rommel called off the offensive on May 4. His troops retained a two-mile-deep salient near Fort Pilastrino for the rest of the siege, but it had been his most costly attack so far; the Afro lost more than a thousand men. Lt. Gen. Friedrich Paulus, who had been sent by the Army High Command to observe operations, was shocked by the casualties and the fact that the German troops were “fighting in conditions that are inhuman and intolerable.” He advised Rommel that there was no chance of capturing Tobruk. The failure to seize the stronghold, the forward base Rommel badly needed for a proposed thrust into Egypt, was the Wehrmacht’s first major reverse of World War II. The Desert Fox received orders from Berlin forbidding him to attack Tobruk again or from advancing further into Egypt. He was told to hold his position and conserve his forces. The hard-driving general was bitter at being compelled to wage a defensive campaign. Encouraged by Rommel’s unexpected setback, British troops advanced from their defensive line in western Egypt and drove the Germans and Italians back toward the strategic Halfaya Pass near the port of Sollum. So far, the British forces had destroyed about 300 German tanks and inflicted 38,000 casualties (twice those of the Allies). The British had been reinforced by the arrival of almost 300 tanks, dispatched in a fast convoy, on the orders of Prime Minister Winston Churchill. In fierce fighting, the British forced the Germans off “Hellfire Pass,” and then were themselves driven off by panzers and 88mm flak guns. Both sides suffered heavy casualties, but the Afrika Korps recaptured most of the territory gained by O’Connor the previous year. Tobruk, however, still held out. While Wavell’s Operations Brevity and Battleaxe kept the Afrika Korps occupied during May and June 1941, the Tobruk garrison enjoyed a welcome lull. General Morshead nevertheless faced problems. His Australian brigades had lost 823 men killed, 2,214 wounded, and about 700 captured in the April fighting. His government demanded that the remaining troops be pulled out and reunited with other Australian units in Egypt. So, in daring night operations carried out under the noses of the enemy, most of the Tobruk garrison was replaced by fresh British, Indian, South African, and Polish troops. Starting on the moonless nights of mid-August, British ships ferried in troops, a tank battalion, food, and other supplies. The transports, berthed in darkness between the rusting wrecks of Italian ships in Tobruk harbor, were swiftly unloaded and were on their way back to Alexandria or Mersa Matruh within the hour. 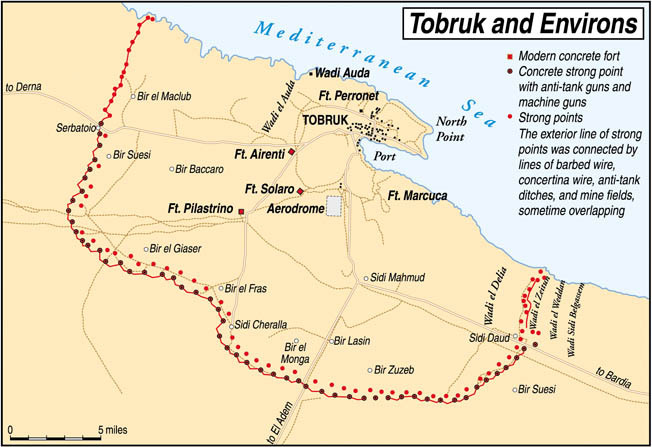 After several months of relative calm, the Germans started increasing their attacks on Tobruk. This time, the defenders faced the scourge of 88mm flak guns, one of the deadliest weapons of the war. Originally used as an antiaircraft gun, the 88 became a devastating antitank weapon. “It could go through all our tanks like a knife through butter,” reported one British soldier. At the start of September 1941, the garrison was hammered by 100 Stukas and repeated tank attacks were beaten off throughout October. That month, the siege of Tobruk entered its sixth month. On November 17, the Western Desert was lashed by heavy rains. The sands became a sea of mud as units of Lt. Gen. Sir Alan Cunningham’s newly formed British Eighth Army churned forward for Operation Crusader. It was an ambitious plan designed to lure Rommel’s armor into battle and relieve Tobruk. On the following day, British Tank Corps groups clashed in driving rain with panzer elements around Sidi Rezegh, 10 miles southeast of the Tobruk perimeter. Eventually, after bitter fighting with heavy losses on both sides, tough New Zealand infantrymen with fixed bayonets linked up with British Matildas from Tobruk that had battered through the German lines. With bagpipes skirling, relieving troops marched into the town on December 10. On the following day, Prime Minister Churchill rose in the House of Commons and triumphantly announced, “The enemy, who has fought with the utmost stubbornness and enterprise, has paid the price of his valor, and it may well be that the second phase of the Battle of Libya will gather more easily the fruits of the first than has been our experience … so far.” Throughout the rest of December 1941, Rommel’s Afrika Korps withdrew westward, skillfully thwarting each British outflanking movement. Rommel, however, was far from being finished. After a five-month lull during which he built up his German and Italian forces, he launched another offensive on May 26, 1942. German panzer and infantry formations hit the Gazala Line, swung around Bir Hacheim, gallantly defended by a Free French force, and battled with British Guards and armored units in the Cauldron, an area so named because of its relentless heat and the intensity of the fighting there. The panzers battered their way out of the Cauldron, swept northward, and eventually rolled into Tobruk on June 20. The British, Indian, and South African defenders had fought bravely, but, outgunned and outnumbered three to one, were overwhelmed. The Germans took 33,000 prisoners, and Rommel told a band of captured British officers, “Gentlemen, you have fought like lions and been led by donkeys.” Churchill called the fall of Tobruk “a shattering and grievous loss” and faced a vote of no confidence in the House of Commons. He survived it by 475 to 25 votes. Tobruk would remain in German hands until it was retaken during General Bernard L. Montgomery’s advance after the great second Battle of El Alamein in October-November 1942, one of the major turning points of World War II.